Using a computer requires constant translation between information that the computer can understand (binary code) and information that you can understand (pictures, letters, sounds). For example, whenever you open an MP3 file, your computer has to convert that digital information into music. Similarly, when you click the button that tells your computer to shut down, that simple on-screen click is translated into a coded command that tells the computer to turn itself off. It's a simple back-and-forth that goes on all the time without us even thinking about it. Now, when we bring the internet into the picture, the translation gets a little more complicated. Let's say that you are sending an email. You will see that email as text and pictures, but all your computer will see is a heap of binary code. Sending that much stuff all in one big chunk wouldn't be very efficient. Before anything is sent away from your computer, it is divvied up into packets. Packets are nothing more than little bundles of binary code. Think of them like the pieces of a jigsaw puzzle. On their own, they're not much to look at, but when you stick them all together, the whole picture is formed. To keep things from getting complicated, each packet carries info about the other packets it needs to be joined up with. In this way, a computer can receive packets from all different sources at once and still know how to put them together properly. In order to get ready for some seriously fast traveling, those packets have to first go from your computer to your internet router. But in order to do that, the packets have to be converted into a form that the router can work with. 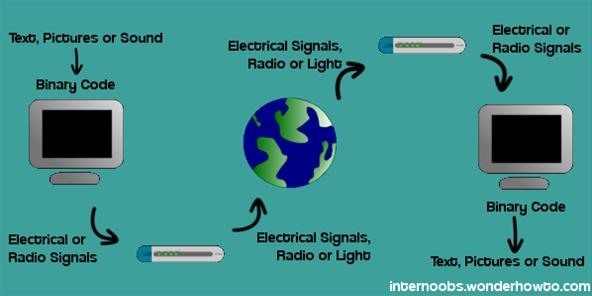 If you are using an ethernet connection (where your computer is plugged directly into your router), the packets will be converted into electrical signals. If you're using a wireless connection, the packets get changed into radio signals. And if you're lucky enough to be using fiber-optic internet, then those same signals will have to be converted once more into light after they leave your router. After those signals get whisked away from your computer, your router sends them on their merry way to your internet service provider (ISP). To put it very simply, if the packets are letters, then the router is a postal worker, and the ISP is the post office. Just like a letter may be handed off to several postal workers before it reaches its final destination, your packets will also be run through many routers before they come to the end of their journey. Once those signals hit the router of your email's recipient, everything has to be converted one more time. The signals get converted into packets of binary code. The packets are reassembled. Finally, the binary code tells your computer what letters and colors to put up on the screen. And all that happens in just an instant. Cool, huh? How To: Setup a Wifi Hotspot on Your Mac. Really fascinating, and elegantly explained.